Tehan, a 35-year resident of Sisters, sang the National Anthem at every rodeo performance for 29 years. Her pure soprano voice impressed Rodeo President Glenn Miller, who first asked her to sing the anthem in 1989. She saddled up, performing a cappella on horseback for all but one rodeo in the ensuing years. During her first performance, Peggy left her three-month-old daughter in the stands with Jean Wells of the Stitchin’ Post. She laughingly recalls hearing her infant howl while she sang. Four years later, the dedicated Tehan sang, without a horse, just a week before the birth of her third child. She is a member of the High Desert Chorale and Bell Choir. In 2014, she formed a ukulele group, which now has over 40 members. She is also a member of a wind instrument recorder group, Renaissance Sisters. The bells and recorders perform by request at many special events in Sisters. She has also graciously sung at weddings, memorials, and special programs throughout her tenure in Sisters, probably more times than she can remember. She has also served on the board of directors at Sisters Park & Recreation District since 2008. Tehan was raised on a family farm and ranch in eastern Washington in the Kittitas Valley. Her father farmed 2,000 irrigated acres to feed the cattle his brother raised on the other 25,000 acres, all owned by their father. When she entered middle school she met her mentor, a newly graduated music teacher who was excited about her skill. With his influence, a professor at Central Washington State University agreed to be her private vocal instructor, recognizing the superior talent in Peggy’s voice. As a high school freshman, Tehan auditioned for the All State Choir and was accepted. The next year, she was accepted in the All Northwest Choir, to perform in Washington, Oregon, Idaho and Montana. In her junior year, she auditioned for the National Choir and was chosen as a member. That summer, the National Choir performed across the nation and in Northern Europe. As a more minor accolade, Tehan and four musically inclined friends formed a high school rock band called The Rubber Band. At Washington State, music was not her focus of study, but she pursued involvement in musical productions, including singing in operas. By her sophomore year, she changed her major to graduate with a degree in vocal performance in 1980. Accepted to a graduate program in music at the University of Oregon, Tehan moved to Eugene. She soon realized she wanted to experience something else after intense dedication to performing. She didn’t take the offer. Instead, she went to work at the original Spotted Mule in Eugene before it moved to Bend. Music was in her blood, she felt, but she wanted to savor other adventures. Tehan began her local Sisters career as a whitewater guide for Cascade Adventures. She often socialized with the crowd at Hotel Sisters’ Bronco Billy’s Saloon, where she brought her guitar and often sang softly and sweetly for the locals. In short time, that attracted John Tehan, a co-owner of the classic Western restaurant and saloon. After dating two years, the couple married in 1987. Feeling the need for a “real” career, Tehan studied to become a certified public accountant. In 1997, the newly licensed Tehan joined Bill Campbell’s accounting service. After a short time, they evolved into Campbell and Tehan CPAs. The Tehans have three children, each accomplished in a chosen field and all part of a home of music. Audrey, wearing her grandfather’s “genes,” created Seed to Table, a nonprofit farming program that teaches Sisters School District children how to grow organic food to benefit subscribers and supply fresh vegetables at Kiwanis Food Bank. That farm is on the Tehan acreage on the edge of Sisters. Hattie is an educator in the Alzar School in Cascade, Idaho, after adventures in South America as a whitewater guide. J.C. traveled the map trying different careers, and is now in wind turbine energy production, with training that is ongoing in an industry that reduces the carbon footprint of energy sources. 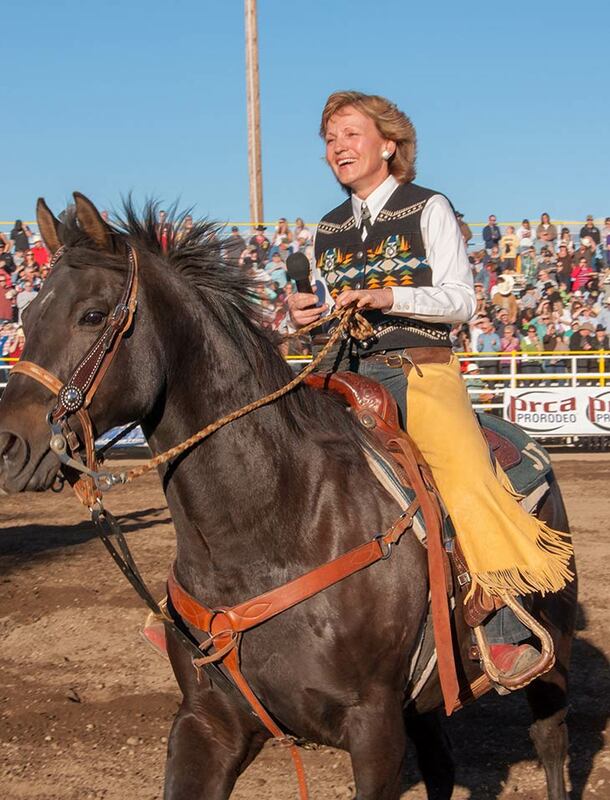 Tehan retired from singing the National Anthem for Sisters Rodeo in 2018. The rodeo held a contest with her as committee chair to bring new voices for each performance. Coming full circle, Audrey Tehan, the howling infant from her mom’s first performance, sang in her mother’s place at the Xtreme Bulls performance last year. “This is such an honor,” Tehan expressed. “I hope to ride a horse in the parade instead of being in a carriage.” Sisters Rodeo hopes to add the carriage with the rest of the family on board. All of them have contributed to the spirit of community of Sisters in so many unique ways. I grew up with Peg in Kittitas. We had many great adventures and still enjoy the memories often. I always knew she would be an inspiration to those around her. I miss her and will always love her. This comment has been hidden due to low approval. What a wonderfully talented lady is our City of Sisters, Or. This comment has been hidden due to low approval.